A movie maker’s website is asking viewers if archival footage that resurfaced this week shows a 21-year-old Bernie Sanders being arrested during a civil rights demonstration in Chicago in August 1963. The clip is part of a documentary called “Boycott ’63” that is set to be released by the Chicago-based Kartemquin Films. A clip that is to be included in the movie comes from a demonstration filmed on the south side of Chicago by Kartemquin founder, Jerry Temaner. 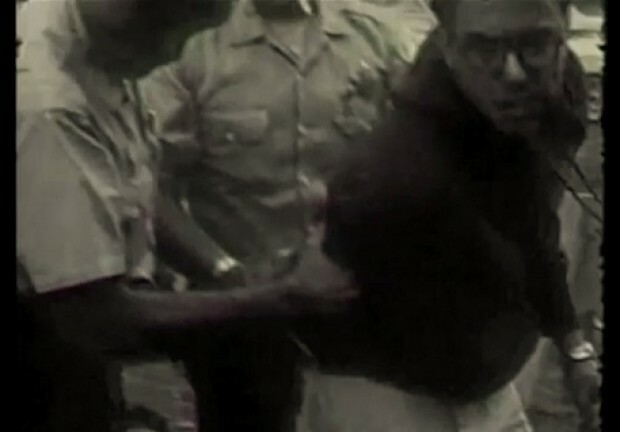 In it, a bespectacled, dark-haired young man closely resembling Sanders is seen being arrested by Chicago police during a demonstration over the city’s plans to build a school using only mobile units. A man closely resembling Bernie Sanders being arrested during a Chicago demonstration in Aug. 1963. It is not entirely clear that the man in the short clip is Sanders, who was a student at the University of Chicago at the time. Kartemquin’s website is seeking help from activists who might know whether Sanders is shown in the video. But it is known that Sanders, who served as chapter president of the University of Chicago’s Congress of Racial Equality (CORE), was arrested for resisting arrest during a demonstration in August 1963. 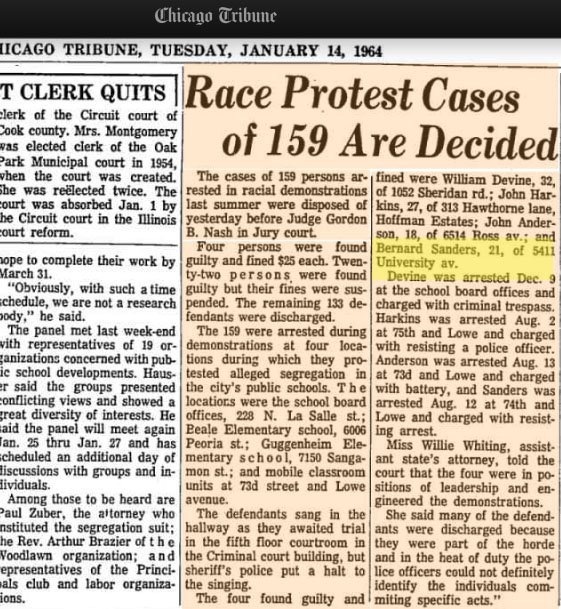 A Chicago Tribune article published the next year shows that Sanders was fined $25 following his arrest. Sanders’ involvement in the civil rights movement has become a focal point of the Democratic presidential campaign as Hillary Clinton has sought to portray herself as more committed to civil rights than her 74-year-old challenger. She has touted her work for the Children’s Defense Fund in the 1970s as evidence of her commitment to the cause. The establishment candidate has also scooped up endorsements from black lawmakers who have sought to downplay Sanders’ civil rights background. Georgia Rep. [crscore]John Lewis[/crscore], a civil rights icon, said last week that during the 1960s civil rights movement he “never saw” and “never met” Sanders. Lewis later clarified his remarks and said that he did not intend to claim that Sanders was never involved in the civil rights movement. But Sanders was heavily involved in activist work during that era. He attended the March on Washington, which was held in late-August 1963. And as CORE’s president, he helped organize a 15-day sit-in to protest the University of Chicago’s policies against renting off-campus housing to black students. Sanders’ involvement in that event has been the subject of recent debate. Time magazine’s Sam Frizell and Washington Post columnist Jonathan Capehart both wrote articles questioning whether Sanders was the man seen in a photograph taken during that sit-in. Sanders and his campaign had asserted that he was the man in the picture. But Time and The Post cited alumni who claimed that the man in the photo was another University of Chicago student named Bruce Rappaport. However, Danny Lyon, the photographer who snapped the picture, came forward to attest that the man in the photo was Sanders. “It looks exactly like the same person,” he said. The Sanders campaign also did not return a request for comment.